CLEVELAND, TN — Atlanta Braves pitching legend and 2014 Baseball Hall of Fame inductee, Tom Glavine, has been named the keynote speaker at the sixth annual Bradley Sunrise Rotary Sunset Gala to be held on June 6 at the Cleveland Country Club. In light of this year’s speaker, this year’s gala will have a baseball theme, and there will be several baseball-related items for sale in the gala’s live and silent auctions. Source: The Chattanoogan. Tom will meet with members of the local media at 5:15 p.m. before attending a private meet-and-greet with Silver, Gold, Platinum and Diamond-level table sponsors. The gala begins at 6 p.m. with attendees being able to view all of the gala auction items while enjoying wine and hors d’oeuvres. This year’s auction items feature an Atlanta Broadway musical package, an evening with NFL quarterback, Peyton Manning, several lavish vacation packages, a local television advertising campaign and jewelry. 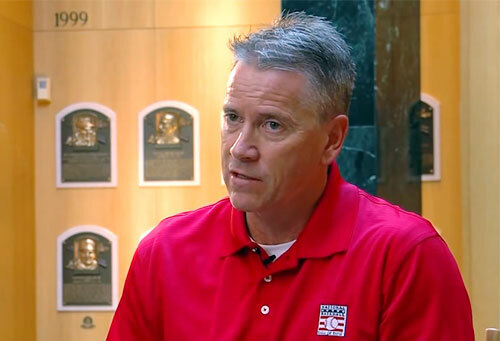 A five-star dinner will be served at 7 p.m.
Watch the following video where Tom Glavine gives his impressions about walking through the Baseball Hall of Fame Museum and chats about his 2014 induction, as well as his career through the years. Tom Glavine is a retired left-handed pitcher who played for the Atlanta Braves (1987–2002, 2008) and New York Mets (2003–2007). With 164 victories during the 1990s, Glavine was the second winningest pitcher in the National League, second only to teammate Greg Maddux’s 176. He was a five-time 20-game winner and two-time Cy Young Award winner, and one of only 24 pitchers (and just 6 left-handers) in major league history to earn 300 career wins. On January 8, 2014, he was voted into the Baseball Hall of Fame, in his first year of eligibility. Starting in 2011, Glavine became a color commentator for Atlanta Braves baseball games. Sports Speakers 360 is a booking agent for pro athletes. If you would like to book Tom Glavine for a speaking engagement, appearance or endorsement, contact Tom Glavine’s booking agent for fees at 1.855.303.5450.